Made from an old barrel set atop a Bamboo stand with a coconut used as a shower head. The water is warmed by the tropical sun, for a great savings in energy! The mesh was made from scratch in MilkShape. 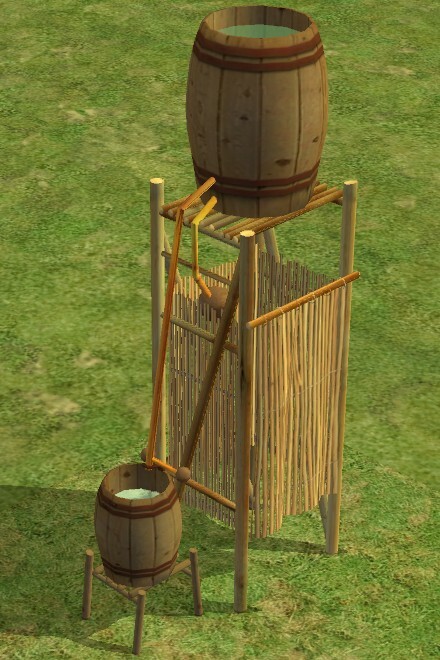 The default shower has bamboo side curtains. Also included is a leaf-sided option, and a bare-bones (just the poles, no curtains) option. Feel free to make your own recolors for the shower. Now available is an add-on barrel sink to go with this shower. Perfect, Perfect, Perfect! Thank you so much!!!! This is awesome. I love the waterfall shower as well, but this one will take but a lot less space. thank you, great for my holiday bach! awesome shower for cast-away-themes! Great work! Check out Omicron-Simtauri, my new space project! Seriously, I've wanted this for so long. 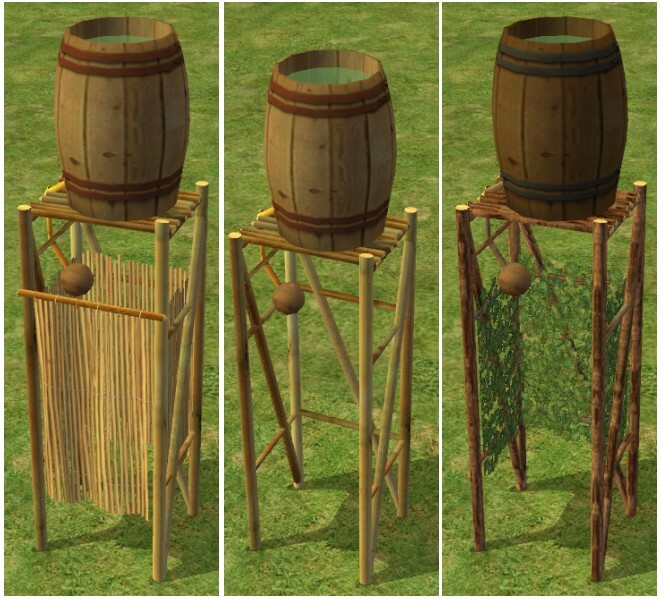 My ancient/hermit/shipwrecked simmies have used a waterfall shower, but I like my sims to "make" things, too. PERFECT!! I was just wishing for something like this the other day, and here it is! Thanks for sharing. Thanks! This is really beautiful and unique. Great job. Can't wait to use this for my medieval peasants. This makes much more sense than the UNI shower does for them. Musiquefille's Modest Mods - well, lots really. simply put - you rock. Thank you so much! A wonderful idea! Love these "home-made" items. Lol I love it DrP =) You are a funny bloke - such eclectic items! Totally creative and very cool! Big thanks for sharing this! I love finding primative things for old fashioned and early legacy sims! Great shower!! fantastic - are we having a castaway challenge? This, and the other recent downloads, is perfect for beachliving sims. I think this would be perfect for a lot in Twikkii island if you have BV. This will work great for some woodland-dwelling bandits in my neighborhood. Off to download the sink now! I've been wanting something like this for ages! Thank you!